During the month of April, we celebrate our dedicated volunteers who enrich the lives of the residents and patients who stay in the A.G. Rhodes homes. We are grateful for our dedicated volunteers who enrich the lives of the residents and patients who stay in the A.G. Rhodes homes. We had over 140 individuals and over 100 different groups volunteer in our homes last year. Those volunteers collectively spent over 6,000 hours with our elders, giving companionship, fun, care and love. Watch a video message to volunteers from our CEO, Deke Cateau. 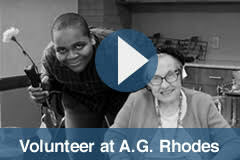 Interested in volunteering at A.G. Rhodes? Click here to become a volunteer.